When I decide on topics for “Below the Belt” posts, I try to stay away from stories that are already receiving a lot of coverage. I figure that people would rather read about something unique than read their 15th take of the day about why “Thursday Night Football causes injuries. Furthermore, I do not have much interesting analysis to add about any topic if a there is already a plethora of material on the subject. Yes, I am talking about Eli Manning and the eight playoff games he won en route to two Super Bowl Championships (2007 and 2011 seasons). In this conflagration of a Giants season, much has already been said and written about everyone involved with the team, and many pieces have been written about Eli. However, in this rare case, I am going to provide you with your “15th take of the day” on something. Simply put, I feel in this case that I can add my own spin on Eli’s career, and I will use the quote above to guide my analysis. For those who have never heard the afore-mentioned quote, it usually finishes with something akin to “…he has been an average to below-average quarterback”, “he has won no playoff games”, or “his last several seasons seem pretty unimpressive”. Obviously, Eli’s detractors – often Jets, Cowboys, Eagles, or Patriots fans – are the ones typically making these claims, but are the claims just? Yes, I am a Giants fan, but I consider myself objective enough when it comes to analyzing the quality of players and teams, even those I passionately like or dislike. I feel I have been completely objective about Eli during his whole career. Given this, I feel there is one context in which the quote shown above is completely unjust and one in which it is totally just. If one is discussing the overall level of greatness of Manning’s career, then it is completely unjust to make the comment. However, if one is judging Manning’s current value as an NFL quarterback, then it is completely unfair. Let us start with the unjust – using the afore-mentioned quote when analyzing Eli’s place in NFL history. When judging anyone’s level of greatness over a career, we must take into account the good, the average, and the bad. To decide arbitrarily to ignore the top moments of Eli’s career is patently ridiculous. Manning is tied for 16th all-time in playoff wins with those 8 wins. (He is tied with Jim Plunkett, Dan Marino, Steve Young, and Russell Wilson.) Right off the bat, that is impressive company. I realize that 16th place is not worthy of a trophy, but it is not a bad place when one considers how many quarterbacks have played in the NFL over the years. Furthermore, it is ironic how Dan Marino and Peyton Manning (tied for third with 14 playoff wins) are maligned for underperforming in the postseason because they could rarely string together several wins in one playoff year. Meanwhile, Eli managed to string together four playoff wins apiece in two different seasons, but some people instead focus on the fact that he has won zero playoff games in his other seasons. Yes, it is fair to consider his 12 seasons with no playoff wins to be a negative on his resume, but one must then also consider his two amazing playoff runs an overwhelming positive. People often overlook the fact that it is not easy to win in the playoffs. I don’t know if you have noticed this, but teams in playoff games are usually pretty good. There is no such thing as an easy playoff game, but Eli is one of the few people to make tough playoff games look easy. Only one of his eight playoff wins came at home; that win was an easy 24-2 win over Atlanta in the 2011 Wild-Card Round. His 2007 Wild-Card-Round win in Tampa Bay was the only other win that is not particularly momentous. His other six wins – all legendary – include: two wins in Lambeau (one a rout of a 15-1 Aaron Rodgers-led team and one a thrilling NFC-title-clinching OT win against Brett Favre), one win at 13-3 post-bye (and post-Tony Romo and Jason Witten going to Cabo) Dallas, one NFC-title-clinching win in San Francisco in which the Niners’ defense knocked him around like Ivan Drago did Rocky, and (of course) the two Super Bowl wins over the Patriots (the 2007 edition being 18-0 turned 18-1). Additionally, while it is fair to say that Eli was somewhat lucky to have David Tyree make the “Helmet Catch”, Eli’s famous pass to Mario Manningham in Super Bowl XLVI is the best Super Bowl pass of all time (in my mind). Anyway, read that last paragraph again. OK, this is a long post, so you do not need to read it again. However, if you did, you would realize that Eli belongs in Canton. To those who say we should ignore those eight games, should we also ignore Cal Ripken’s consecutive-games-played streak or A-Rod’s dominant 2009 postseason? Of course not. Some Hall-of-Famers have steady greatness over long periods of time; others have amazing greatness over long periods of time; and yet others – such as Eli – have brief moments of greatness. It is more than fair to say that Eli’s eight playoff wins were the greatest moments of his football career, but those wins happened. Not only did they happen, but they happened on the biggest stage. You cannot take those legendary performances off his resume. However, if you do remove them from his resume, you are left with something that is not so pretty. This leads me to my other main thesis, that it is fair to use the “…but if you take away those eight games…” line for evaluating Eli Manning’s current value for the Giants or for other NFL teams (via prospective trades). When deciding Eli’s current worth, it is reasonable to analyze his full body of work and to give added weight to his more recent performances. Furthermore, since playoff games are single games, it is fair in this context to say that success in four games does not compensate for underperformance in full 16-game seasons. As I mentioned earlier, I do not want to give you stuff you can find elsewhere. FiveThirtyEight has written a great piece on Eli being a mediocre quarterback. (Try to say “mediocre” and not think of Richard Sherman. You can’t do it.) The article uses modern individual quarterback stats to compare Eli to other quarterbacks of his time. These stats do not make Eli look very good. However, anyone who plays fantasy has seen plenty of quarterbacks have terrible games and end up 370 yards from garbage time while also seeing quarterbacks dominate and throw for 170 yards. It is like comparing Drew Brees of the past few years to Drew Brees of this year. In an era in which quarterbacks have a huge hand in teams’ success, I judge modern quarterbacks much more strongly on team performance than on individual performance. Unfortunately for Eli, focusing on team performance continues to support FiveThirtyEight’s “Eli is mediocre” claim. 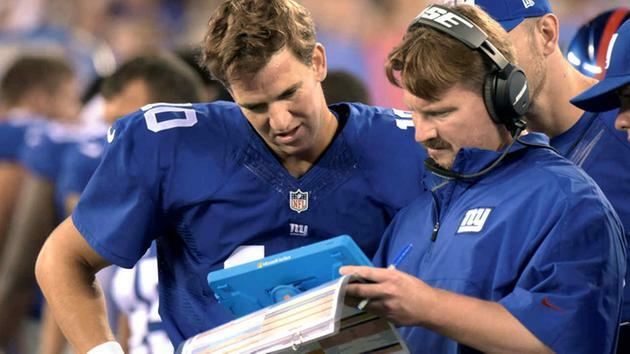 Many people refer to Eli’s first season with Ben McAdoo as offensive coordinator (2014) as one of Eli’s better seasons. This is utterly untrue. I watched every Giants game that season. 2014 Eli was every bit as underwhelming as 2013 Eli. Most people acknowledge that Manning had a rough 2013. That said, the only differences between Manning’s 2013 and 2014 performances were that McAdoo had Eli throwing shorter passes in 2014 and that he Eli dominated in garbage time in 2014 – both within games (like when the Giants fell behind 40-10 against the Colts but ended up losing 40-24 with Eli throwing for 357 yards) and within the season (three of his best games came against weak opponents in Weeks 14-16 after the Giants had started the season 3-9). His piece de mediocre resistance that year came in a 16-10 November loss to the 49ers. The name of the Niners’ quarterback that day escapes me at the moment, but he had an underwhelming game in the midst of his first of two consecutive bad seasons as the Niners’ starter. However, Manning was worse than that quarterback in this game. Manning threw for 280 yards and 5 interceptions. Five! Anyway, Manning managed to throw for his third-highest season yardage total (4410) that season, but he did not have a good season. As I mentioned earlier; in the modern NFL, there is one reasonable way to judge a quarterback, and that is through wins and losses. Sure, in the 1970s and 1980s, quarterbacks threw sparingly, so it was less fair to judge a quarterback this way. However, nowadays, quarterbacks throw often enough that this is the fairest way to judge quarterbacks. People do not care about individual stats like they do in baseball. Great quarterbacks win. Plain and simple. Look at that again, 110-99…and let’s be frank, with six games left this season, he could easily be 110-105, precipitously close to .500, by January. Additionally, since the beginning of 2013, Manning is 31-42 in the regular season. There are many Giants fans who refuse to speak ill of Eli and want him to remain the quarterback for years to come, a la Tom Brady with the Patriots. However, there is one major difference between the two. Tom Brady wins 11 games in a bad season; on the other hand, Eli is 31-42 over the past five seasons. Meanwhile, Eli’s advocates cling to the fact that he won two championships before Russell Wilson entered the NFL. Again, those championships are fair exhibits in discussing Eli’s status as a potential Hall-of-Famer, but they ring hollow in discussing what the Giants should do with Eli now. That .526 tells the story, and that figure includes his seasons from 2009 through 2012, when I feel he played his best regular seasons. Those were the four seasons when the Giants were good but were not a “ground and pound team” as they were for Eli’s first 5 seasons. Furthermore, while Eli won two Super Bowl MVPs – again, honors that help his Hall-of-Fame case – he was never in the conversation for NFL MVP. Also, there was never a time when he was a Top-5 quarterback in the NFL (in my opinion). All of this stuff matters for what the Giants should do now. Manning was never a dominant quarterback in his prime, and he is several years past his prime. He has underwhelmed over the past five seasons, and, with his advanced age, he is sure to continue his performance decline. It is time to see what Davis Webb can do. The Giants have nothing left for which to play (other than a high draft pick), so they might as well see what they have in Webb. If he goes out and dominates over the next seven weeks (not likely, but you never know), then the Giants can focus on other needs during the draft. If Webb looks bad, the Giants know that they need to draft a quarterback this April. The one thing that cannot happen is that the Giants cannot plan to have Eli Manning as their starter next September. Sure, the Giants’ offensive line is terrible. Sure they have a weak running game. Sure, Beckham is out. However, look again at that long list above of quarterbacks’ winning percentages. Many of those quarterbacks were able to win with weak lines, weak running games, and/or no top receiver. It is time for the Giants to find Eli’s replacement, and they might as well start the process over the last seven weeks of 2017. I will add another point. For a moment, forget about players’ current salaries. If the Giants were to offer Eli Manning up for a trade in the offseason, how many teams would certainly trade for him to be their starter? In my mind, there are two: Denver and Cleveland….and that is only if they do not grab two of the major college quarterbacks prospects themselves. Giants fans can sing Eli’s praises as much as they want, but the truth is that he does not represent an upgrade over Tom Brady, Jay Cutler/Matt Moore, Tyrod Taylor (although he is no longer Buffalo’s starter), Josh McCown, Big Ben, Andy Dalton, Joe Flacco, Marcus Mariota, Andrew Luck/Jacoby Brissett, Blake Bortles (OK, he is probably tied with Eli, but the Jags like Bortles), Deshaun Watson, Derek Carr, Alex Smith (or likely Patrick Mahomes), Philip Rivers, Kirk Cousins, Carson Wentz, Dak Prescott, Mitchell Trubisky, Case Keenum/Teddy Bridgewater, Aaron Rodgers, Matthew Stafford, Matt Ryan, Jameis Winston, Cam Newton, Drew Brees, Carson Palmer, Russell Wilson, Jimmy Garoppalo, or Jared Goff. That is a pretty telling sign. Eli Manning is a two-time Super Bowl MVP who belongs in Canton. Eli Manning led the Giants to eight legendary wins that represent some of the greatest moments of my life. Eli Manning is as good, kind, humble, and charitable a human being as one can find in the NFL or anywhere, for that matter. 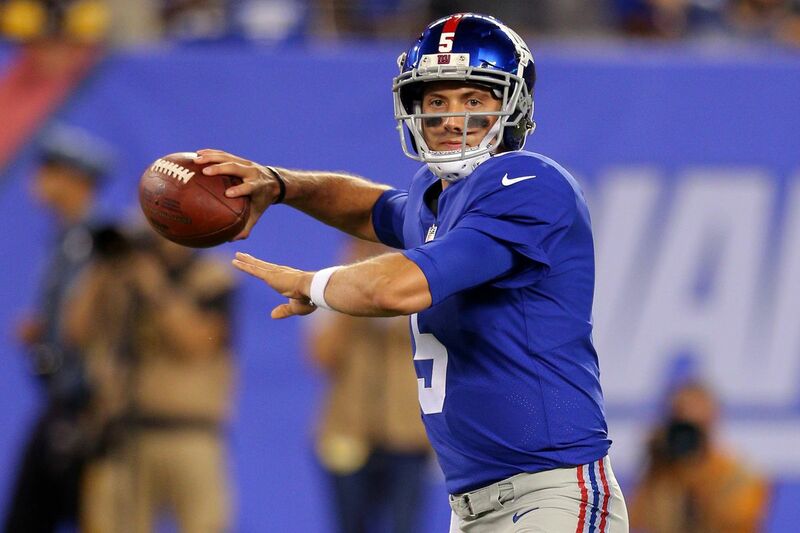 However, he has been an average regular-season quarterback who has dominated when the games matter the most…..and it is time for the Giants to move on to a new signal caller.